To tell you the truth, I'm hesitant about reviewing this book at all. Why? Because it was bad? No. Because it was better than I expected? No. Because I'm afraid of you having a different opinion than mine? No. It's one thing to review a book when you don't know the author. It's another thing to review it when you think he might read what you wrote. (That has happened to me before and was mildly embarrasing because I flat out did not like this particular author's book and said so.) Coupled with the fact that I really don't know what to say about this book, well, this review might be different (and shorter - maybe) than most. For the record: I liked this book. Very much. However, I'm not really sure that I explain exactly why which makes this review unhelpful. 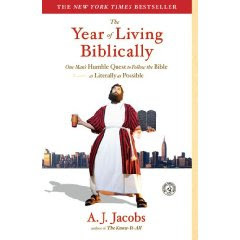 I found Jacobs to be witty, informative, "well-balanced" (secularly speaking), thought out and diligent in using the time he had (one year) to explore the Bible. He only had a year which he confesses just is not enough time to barely scratch the surface and it's true. It takes a lifetime of applied study which, btw, is what Christians ought to be doing and frequently aren't. I finished this book a few days ago and wanted to sit on my thoughts a bit before sharing and finally I came to this conclusion: I think that Christians in particular ought to read this book along with Bertrand Russell's Why I Am Not a Christian.. I read Russell's book about a half dozen years ago and found it enlightening. It's kinda like reading Screwtape Letters in the sense that you have an opportunity to see what the world sees when it looks at Christianity. It's extremely educational and I think Christians ought to read it very humbly and take notes. This book made me think about my faith in the same way Russell made me think. Jacobs is not a Christian and yet felt the need to explore religion and test whether or not God existed. He is honest in this book, forthright and gives you plenty of reason to believe that he explored and studied his options. He visited with people from Answers in Genesis, rabbis, read Borg (who, btw, I heartily disagree with), C.S. Lewis, retired pastors, and did his best to consult as many people "of faith" as was humanely possible in a year's time. For someone who started out as an agnostic, I think he really went the distance (although I wish he had consulted some different people or additional people than he really had time to do). But if you are starting out on a faith-based journey and don't know who to go to for help and information then I think he did a really good job. Bottom line: pick up this book. I think it will inform Christians, educate them, sometimes make them feel ashamed, confirm deeply held beliefs and opinions and will call on emotions you might not necessarily be enthusiastic about experiencing while reading. But it's like medicine - it's good for you. I accepted Jesus Christ as my Lord and Savior when I was 8 years old. I was raised in a Christian home. I have never known life without God (and would never want to). Books like these are therefore very good for me to read because they tell me what life "on the outside" of God is like. I realize there are a lot of books that could describe that for me but most are filled with a pathetic amount of distracting filth that I'd rather not fill my mind with. Jacobs presents truth in his book - although maybe not in a way that you would expect - educating and motivating as he goes along. I was surprised by this book and well-pleased. You caught me, I'm afraid. I still commit the sin of pride and Google myself now and again. I loved your review. It was funny and thoughtful. Thanks so much for writing it. I've put this on my to-read list. Thanks! Sounds like a great book, and the author commenting is just stinking cool! Carrie--this is SO funny! I actually called someone out on my blog once (the guy who visited all 200 Starbucks in Manhattan in 24 hours). I KNOW he was Googling himself, but he didn't say hi. I don't know if I saw this review the first time around, but I loved this book. Have you read The Know It All? It's his first book, and I actually think I like it better.